The state Strategic Growth Council Thursday announced almost $30 million in grants for two San Diego infrastructure projects meant to integrate affordable housing complexes and promote sustainable transportation. The City of San Diego was awarded nearly $20 million to install two miles of protected bike lane and more than half a mile of walkway upgrades along Sixth Street and J Street. 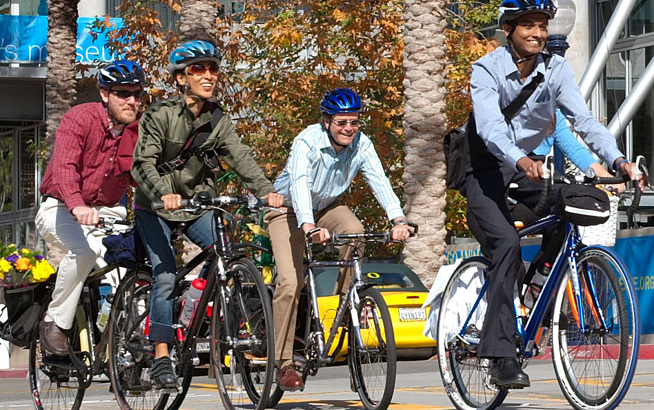 The project is intended to improve downtown bicycle connectivity with a proposed housing complex near the 12th & Imperial Transit Center that will provide 407 units, including 270 that will be affordable. The second grant of nearly $10 million went to Community HousingWorks to build more than a mile of walkway upgrades intended to increase pedestrian safety between a school, grocery store, park and proposed housing complex at Keeler Court and Alpha Street. The complex will provide 71 units of affordable multifamily housing. The grant also will fund bike infrastructure linking the Southcrest neighborhood with downtown. Overall, the council’s latest round of Affordable Housing and Sustainable Communities grants awarded more than $257 million for 19 statewide projects. Apart from lowering greenhouse gas emissions, projects are intended to make public transportation more appealing via proximity. To date, affordable home development and other projects awarded through the program will avoid the release of more than 1.5 million metric tons of greenhouse gases, the equivalent of taking 320,000 cars off the road, according to the council.